An excellent product. Lowered my liver levels dramatically in one month. Will definitely purchase again. I'm a retired nurse and very much appreciate natural alternatives for health concerns. 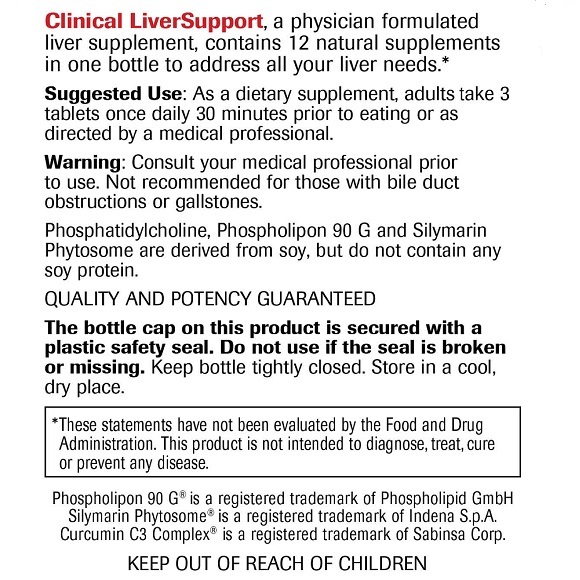 I thought the extra ingredients in this product made it an excellent choice for anyone with liver problems. 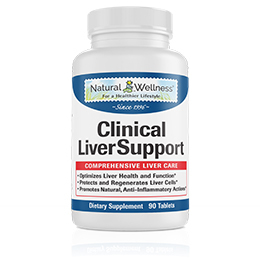 Clinical LiverSupport™ is the most potent, comprehensive, physician formulated, combination formula for improving and protecting your liver's well being. 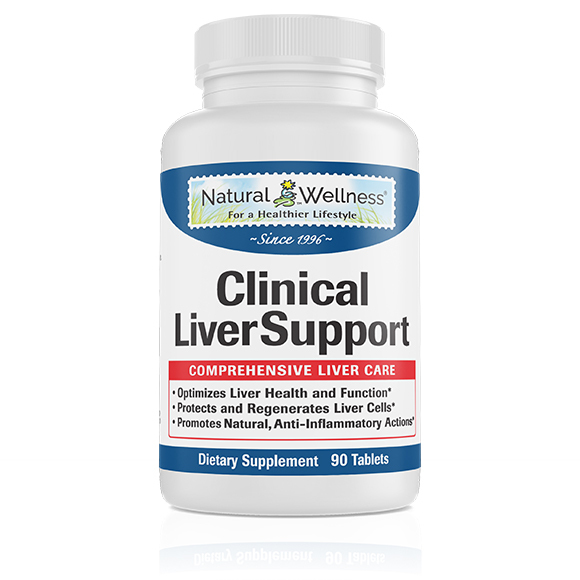 Clinical LiverSupport contains 12 natural ingredients, each picked for its specific benefits for your liver's health: Read what each ingredient is and what it does for you and your liver. 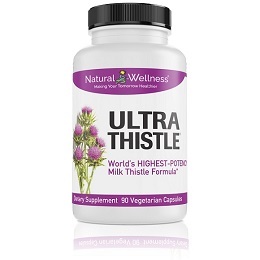 Milk Thistle – Is the #1 herb recommended for liver health. 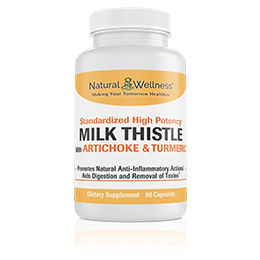 However, most milk thistle is not well absorbed by your body. 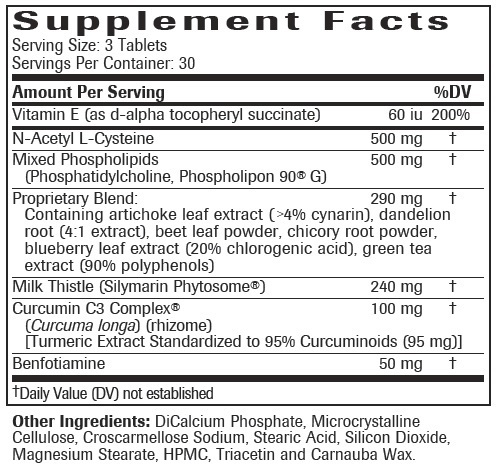 Meaning very little of its beneficial ingredients are actually utilized by your body. To fix this problem, we've included a patented form of milk thistle that is scientifically proven to deliver up to 10x more milk thistle into your bloodstream and to your liver, where it is needed most. 10x the absorption leads to 10x the utilization and 10x the benefit. Mixed Phospholipids (Phosphatidylcholine & Phospholipon® 90G) – Research has proven that phosphatidylcholine, an integral component of cell membranes, supports liver health by promoting healthy liver enzyme and toxin fighting activities. Additional research shows that phosphatidylcholine also promotes fat break down, antioxidant, anti-inflammatory and metabolic activities. 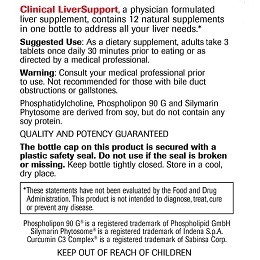 We combined phosphatidylcholine and Phospholipon® 90G, the purest form of phosphatidylcholine available on the market today, to give you the best combination of phospholipid liver support. Curcumin C3 Complex® – Scientists have discovered that curcumins, the active ingredient in turmeric, provide many health benefits for your liver and overall health. As a natural COX-2 inhibitor, curcumins attack the enzymes that are responsible for inflammation and pain in your liver and total body, which also reduces the stress on your liver and your entire body. However, unlike many over the counter and prescription anti-inflammatory drugs, they do not cause gastrointestinal side effects or ulcers. Curcumins also aid in liver detoxification by inducing Phase 2 detoxification enzymes that help your liver better break down and remove toxins from your body. They also improve bile production and flow which aids in digestion, immunity and overall liver health. They are effective antioxidants that neutralize free radicals and help prevent the formation of new ones. 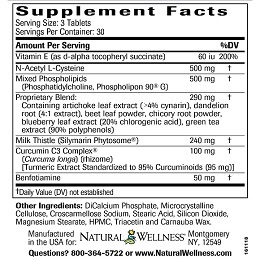 Curcumin C3 Complex® is the premier, standardized turmeric product available. Its proprietary, registered formulation of curcumin, demethoxycurcumin and bisdemethoxycurcumin – collectively known as curcuminoids – is meticulously extracted to produce the finest quality complex available. N-Acetyl L-Cysteine (NAC) – A precursor to glutathione, the body's principal antioxidant that neutralizes free radicals and detoxifies harmful substances, NAC helps restore glutathione levels in the liver and helps protect the liver from toxins produced during normal detoxification processes. It also promotes a healthy inflammatory balance in the liver and supports the immune system by scavenging free radicals. As you grow older your glutathione production naturally decreases. Additionally, since much of the glutathione in your body is produced in your liver, people with liver issues will produce even less glutathione, forcing your liver to work harder to perform its many functions, leaving you more susceptible to more severe liver issues and the many age-related health issues. Since glutathione is not well absorbed if taken orally and If you are unable to manufacture all the glutathione you need, supplementation with NAC is highly recommended. Vitamin E – The many benefits of Vitamin E are well documented. It is truly an extraordinary antioxidant that not only helps to defeat free radicals, but can also stop the biological pathway that triggers inflammation in your liver and throughout your body. Research also shows it is integral in helping to prevent liver cell deterioration and for improving liver function. Blueberry Leaf – Rich in antioxidants that fight free radicals and reduce oxidative stress, blueberry leaf fosters natural anti-inflammatory actions and healthy aging. Blueberry leaf also promotes healthy glucose levels, which are extremely important for people with liver issues since one of the primary functions of the liver is to convert glycogen into glucose and release it into the bloodstream to normalize blood sugar levels. Green Tea – There exists a wealth of information describing the benefits of green tea on the body's functions. The catechins found in green tea promote liver, cardiovascular, immune, brain and cellular function as well as healthy weight management. The antioxidant power of polyphenols has been shown to be 20 times more powerful than Vitamin E and 50 times more powerful than Vitamin C. In addition to its many antioxidant benefits, research has shown green tea helps inhibit fatty deposit formation in the liver and it protects cells from lipid peroxidation. Benfotiamine – A fat-soluble form of thiamine, also known as Vitamin B1, benfotiamine is involved in helping the body better utilize the glucose produced by your liver. This is extremely important for people with liver issues, since one of the primary functions of the liver is to convert glycogen into glucose to help regulate your sugar levels. A compromised liver may not be able to produce as much glucose as you need, so better utilization of what is produced is important. Artichoke – A diuretic that stimulates liver, bile and digestive functions. Bile, which is produced in the liver, is needed in your digestive process to break down fats, enable your body to utilize the nutrients from the food you eat, and to help remove the items your body cannot use. It also supports hepatic cell function and blood flow in the liver while reducing toxic exposure to the body. Artichoke also contains luteolin, which researchers believe supports hepatic cell regeneration and liver tissue health. Dandelion – A diuretic that stimulates liver and bile function, dandelion promotes the regeneration of liver cells, improves your digestion and helps eliminate toxins from the liver. Research shows it is also a COX-2 inhibitor that discourages the production of cytokine and interleukin, which are responsible for inflammation and pain. Chicory – Chicory has been shown to be a powerful hepatic stimulant which increases bile creation and flow and promotes digestion and metabolism function. Evidence also shows it helps your liver convert glycogen to glucose to promote healthy glucose levels. Lastly, it kills free radicals and works to protect the liver from certain toxic chemicals. Beet Leaf – Used to support a healthy metabolism and liver, beet leaf helps to prevent fatty deposits from forming in the liver and to remove toxins from the body. By protecting one of the body's most important organs, the liver, Clinical LiverSupport has enormous health benefits for everyone. A growing number of Americans have valid concerns for their liver's health. Optimizing liver cell function applies to a variety of circumstances–including after successfully triumphing over a liver ailment. The medical community may view a person who completed treatment successfully as "cured," but their liver health may still be weakened from their ordeal. New medications are capable of eradicating a liver-focused pathogen from the bloodstream, but there is still reason to support the liver in the treatment's wake. Successful treatment is often predated by years–or decades–of harm to liver cells. Nourishing, supporting, protecting and strengthening surviving liver cells can help improve liver function and enhance the liver's resilience to future challenges. Your liver is one of the most important organs in your body and is responsible for over 500 functions. 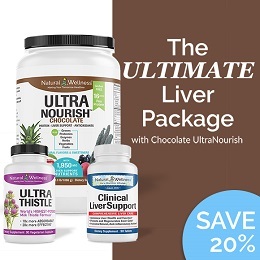 Your liver regulates the production of bile needed to digest and absorb fats, manufactures important enzymes, proteins and immune factors, processes almost everything we ingest and provides storage for crucial substances such as vitamins, minerals and glycogen until they are needed. It even is responsible for converting glycogen to glucose to help regulate your blood sugar levels. Because of the liver's varied functions it impacts almost every system in the body. Damage to this organ can cause numerous negative consequences throughout your body. Many people are unaware that they have any liver damage. In fact, there is a high correlation between being overweight and having poor liver function. According to the Centers for Disease Control (CDC), up to 30% of the U.S. population has abnormal fat accumulation in the liver, which can affect liver function and lead to more serious liver and health issues. With approximately 50% of the U.S. population being overweight and over 25% being obese, the CDC projects that 90% of these people have liver issues starting with fat accumulation in the liver. If you are overweight, you may be one of these people. The good news is most liver issues can be reversed if caught early enough. Clinical LiverSupport was developed to nourish, support and provide comprehensive protection for your liver and to help produce new healthy liver cells. Curcumin C3 Complex® is a registered trademark of Sabinsa Corporation. Phospholipon® is a registered trademark of Phospholipid GmbH, LLC. AST & ALT Levels From High right back to Normal in 2 months! Over the summer between weddings and birthday parties, my liver levels went up as you can see in the picture and after 2 months of taking this daily as suggested my liver levels went right back to normal. I'm a lifetime customer. I will order it again! VERY high quality liver support. Buy Liv.52 ,, that truly lowers enzymes and triglycerides on the test. LiverCare (formerly known as Liv.52) primarily assists the liver in healthy detoxification, which in turn assists in overall liver health and function. Again, while some people may see a reduction in enzyme levels due to the elimination of toxins, not everyone will experience this as a direct result of taking the product. I have been using this product for 3 years since I had cancer removed from from liver. I have first stage cirrhosis of the liver. 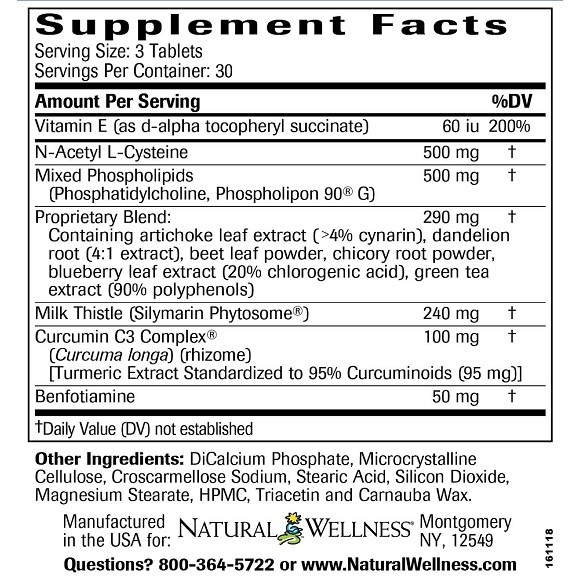 My research showed this product had majority of what is supposed to help heal the liver. Not sure if this supplement is the cause of my stable MRI results or maybe combo of exercise, eating healthier with this supplement. But something is working so I will continue to take these everyday!! Definitely worth the $$ and is of a good value. You get what you pay for. 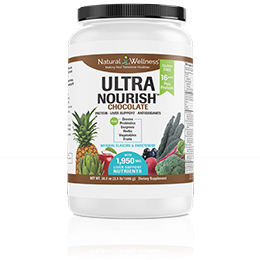 This supplement was taken to improve my liver enzymes as well as to reduce any fatty liver and pancreatic infiltrates, and even after one month, my lab work seriously improved, including my A1C (which was unexpected). Had my enzyme levels tested and actually increased after using this "best ever" product for one month with zero changes to my diet at all. Would not buy it again. Your basic thistle at a cvs will do the exact same thing and probably save you 25 dollars. Rated # 1 on the market for liver damage and repair. AMAZING HANGOVER PREVENTION AND CURE! sent as a gift to a sister and she loved it!!! I had elevated liver enzymes and after using up one bottle of this, I had them tested again and they were back to normal? I ordered another bottle to take for maintenance but quit due to the high cost. If my liver enzymes ever go up again, I will reorder. The abnormal liver enzyme tests I was having are now normal. I initially found this product and started taking it while I was in the middle of a 3 week attack period around 6 months ago. Since then I can say I haven't had an attack and I am loving it! [My doctor] wanted to remove my Gallbladder right away without any hesitation and I didn't really want to part with it. I went back a week and a half later for a follow-up and I had no more pain. He kind of shrugged his shoulders and said if it works then keep doing it. This is all around a great LIVER VITAMIN, especially those w/hep c...this is my own personal opinion...I also take Meso silver & milk thistle. My biopsy was better from 3rd stages to one stage inflammation. Doctor told me to take. Not sure yet if they helped. It seems to be working. I had my liver enzymes checked again recently and they were closer to normal levels after taking this product. The itching I sometimes experience from liver toxins have also subsided. I am a Celiac patient; so, I have problems with the bile salts in my blood. I have had no side effects from this product. But it's not making me feel crappy either. Not sure what this is doing for me. Haven't noticed any difference in anything. But it's not making me feel crappy either. Take three tablets once per day 30 minutes prior to eating or as directed by your medical professional. Each bottle includes 90 tablets - a one-month supply. Clinical LiverSupport™ is MANUFACTURED in the USA to meet FDA strict current Good Manufacturing Practice regulations (cGMP).